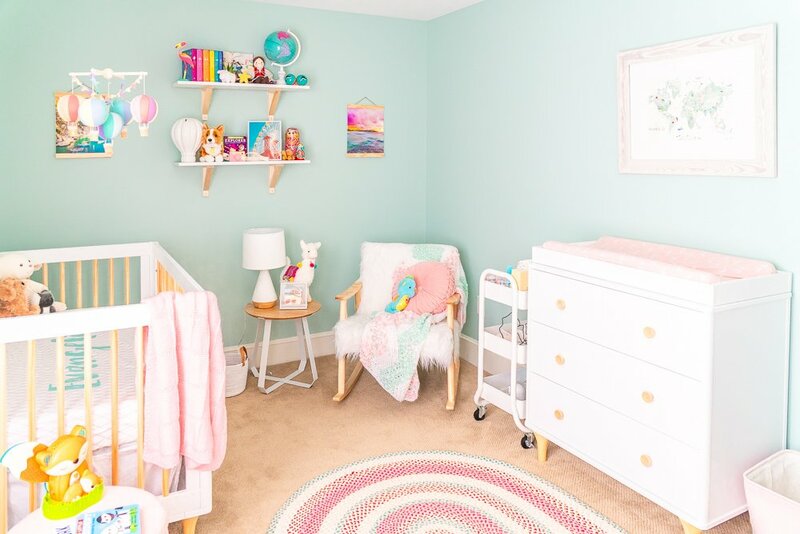 This Travel Themed Nursery is filled with simple and stylish inspiration for a baby girl’s room! With custom pieces, modern furniture, and global decor! 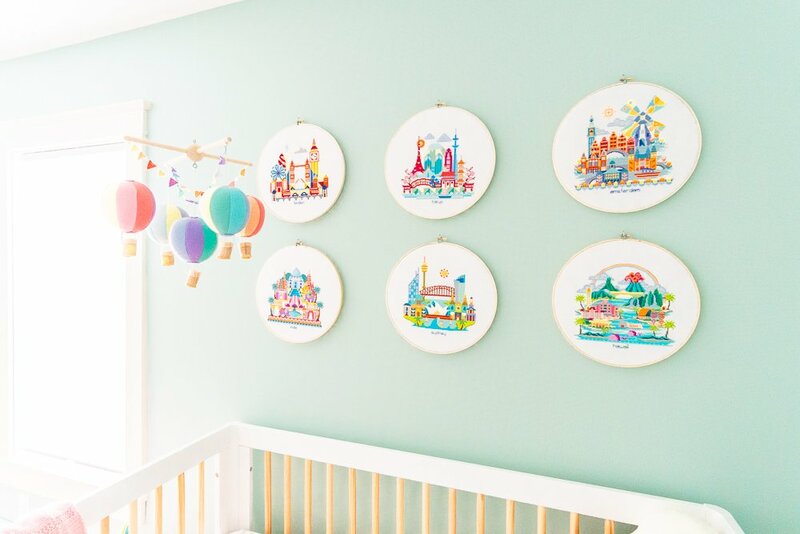 Evie is 6 months old and sleeping in her room, so I thought it was time to share her Travel Themed Nursery with all of you. It was a labor of love, lots of internet searching, and literally traveling the globe to put it together, but I’m so in love with this room. It’s my favorite in the house! Before I was even pregnant (like years before), I began collecting items from my travels for our one day Travel Themed Nursery. Maybe that seems a little insane, but I knew the theme I wanted, regardless of gender. Originally, I had planned to keep things very gender neutral with the decor. I had purchased a print in Vienna, Austria in December 2017 that I thought would be the focal point of the room. But it just didn’t feel right when it came time to start bringing my vision to life. 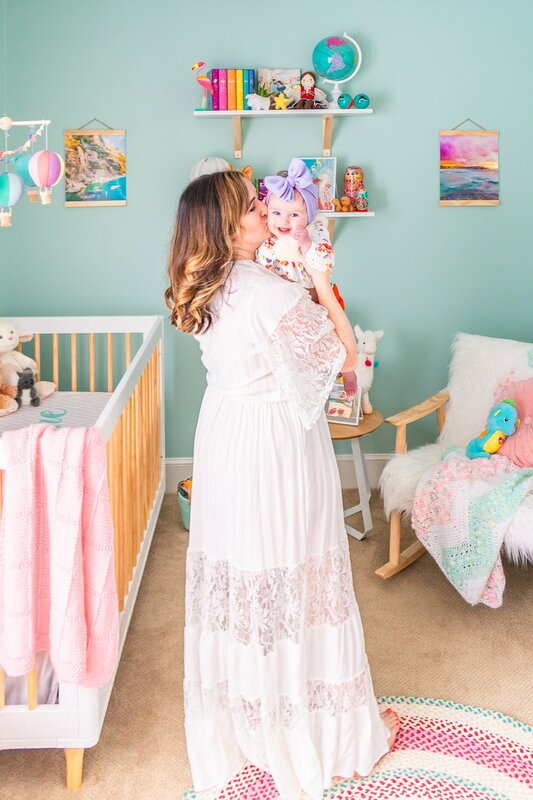 When we made it through the first trimester, we purchased the Babyletto Lolly 3-in-1 Crib, Babyletto Lolly Dresser, and Graco Premium Foam Mattress. A few weeks later I found the end table (Similar) and Project 62 Ceramic Lamp and the room really started getting a foundation. The stuffed Llama is from Hobby Lobby. Then it was time to choose a paint color. This was so much harder than I thought it would be. We had to choose a color before we knew what we were having because it was the only time our painter could fit us in. We ended up going with Kind Green by Sherwin Williams and I really really really love it! In fact, I loved it so much we painted our bathroom the same color! It’s such a nice color because of its beautiful blue and green hues that tend to change with the lighting. And I liked that it’s a cooler color with warm tones and it was really easy to decorate around! The next piece I found was the rocking chair. 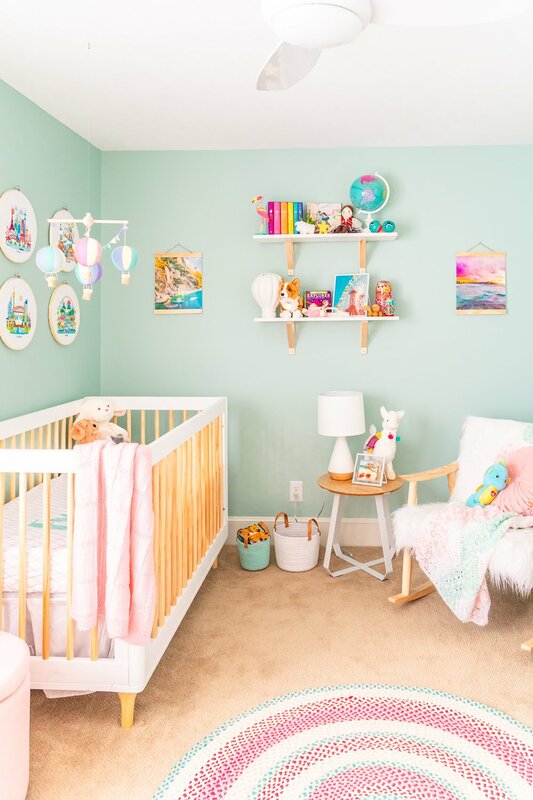 Guys, nursery rocking chairs are hella expensive, like I couldn’t believe that many of them were more than her crib. And I just couldn’t bring myself to pull the trigger on one. For a while, I just told myself I could do without one. But then, like most things in my house, I was shopping at Marshall’s and this beautiful beast was just sitting there in all its glory. And I really kind of loved it. But, there was the obvious. Then I brought it home and it was the joke of the family for like 3 weeks and I told everyone I would just return it. 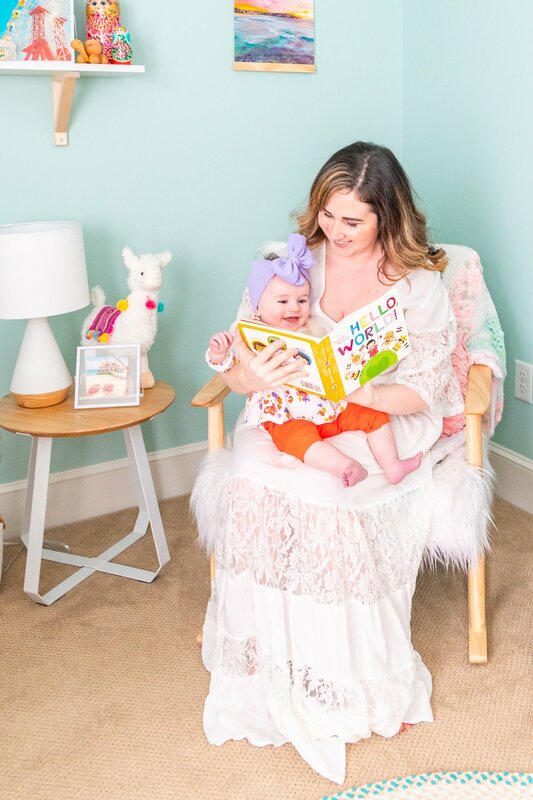 But I couldn’t bring myself to do it and I’m so glad I didn’t because this chair is where I read to Evie before and after she was born, it’s where I pump, and it’s where I escape to when I just need 5 minutes of reflection. Also, I super love the wooden frame so if the sheepskin ever does get to crumby, I will just reupholster it. You can find a similar chair here. The Pleated Velvet Round Throw Pillow is from Target and they have a few other colors too. 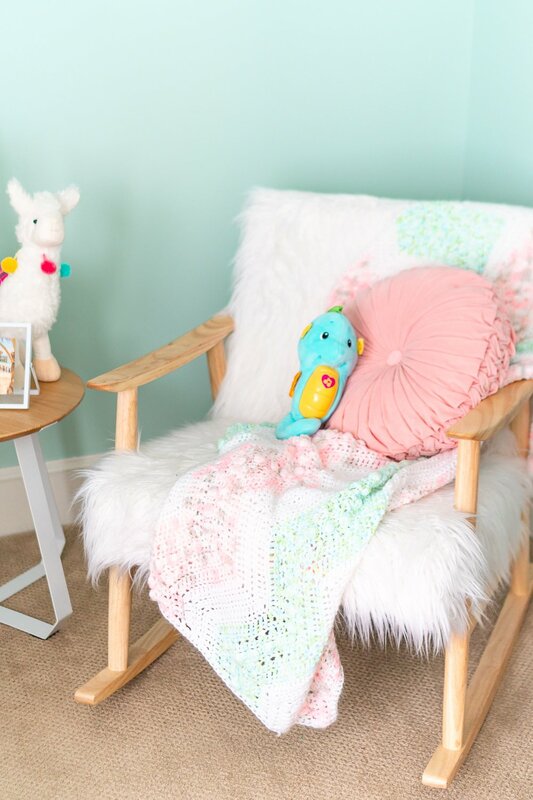 Then I finally found this Pillowfort Pink Braided Rug at Target and it was a great inspirational piece for the accent colors of the room. It’s hard to tell online and in pictures, but it has two shades of pink, mint, yellow, white, and purple in it. One of our first projects was putting the bookshelves up. 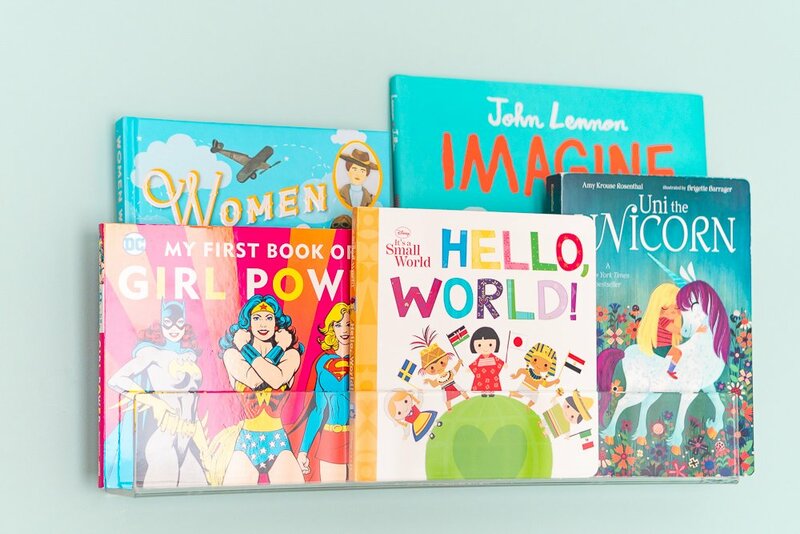 These Acrylic Book Shelves are behind her door and it seemed like a great way to utilize unused space since there is 6-inches between the wall and door. It was a little nervewracking to put holes in the wall because it meant we were really committing. But I’m so happy with how they turned out. And they actually hold a ton of books! I’m guessing we have about 25 books on them most of the time. 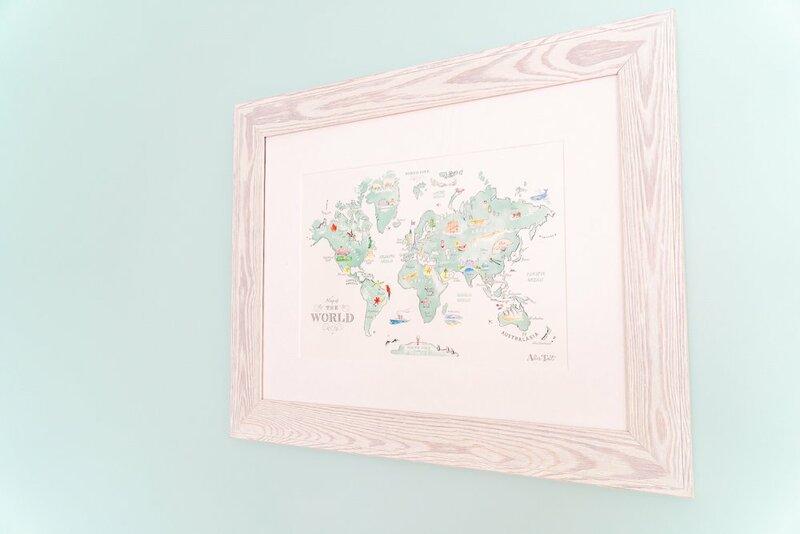 I found this World Map Print by Alice Tait at TJ Maxx and fell in love with it. I had it custom framed at Hobby Lobby and had expected it to be the focal point of the room. It turned out beautiful but I was still feeling a little uninspired by room. I thought about just doing hot air balloons or something, but nothing really felt right. Then came 3,459,627,839 hours of searching the internet and then I finally found them! I have never been a big “name-over-the-crib” person. I don’t think there’s anything wrong with it, it’s just never really been something that I’ve wanted to do. 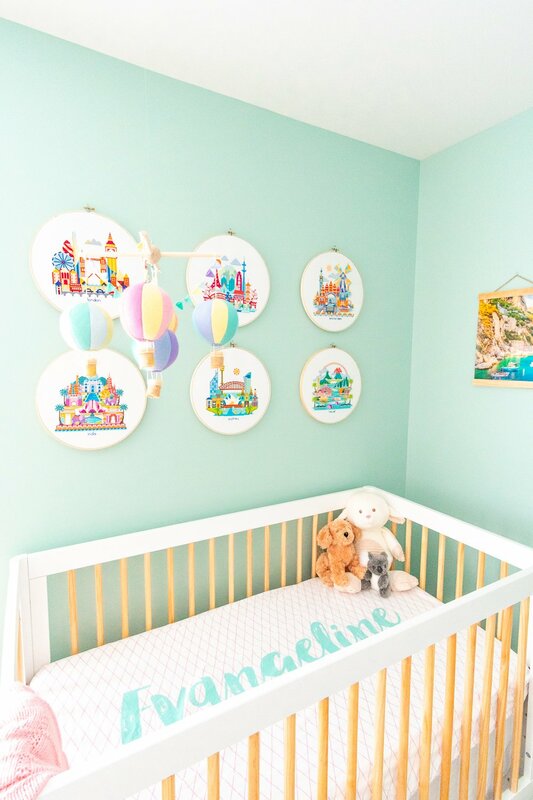 But I really wanted the over the crib art/focal point to be something really unique. 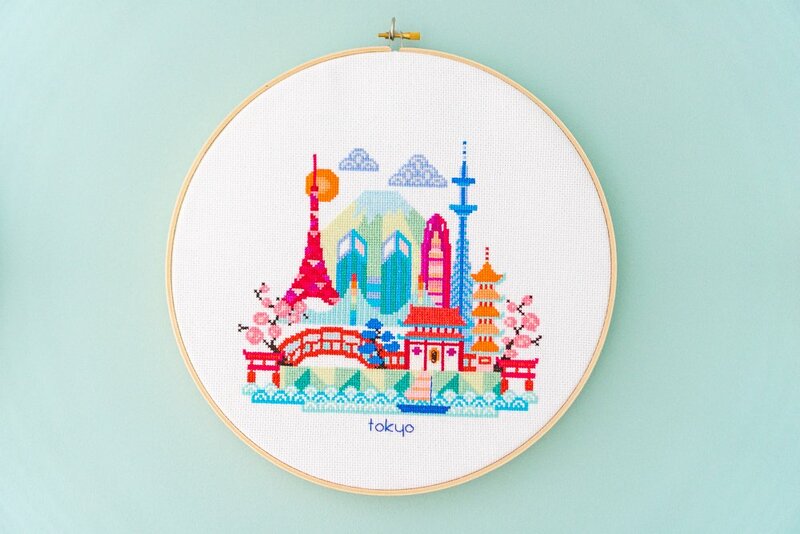 It took awhile, but when I found these Travel Cross-stitch Patterns on Etsy, I was instantly in love. 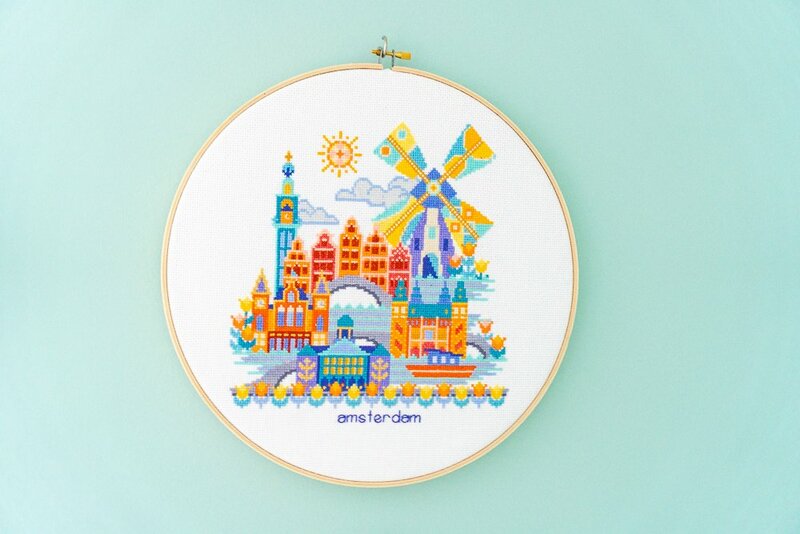 However, I don’t know how to cross-stitch and I had absolutely no idea the number of hours it would take to complete these. But my nana’s best friend/honorary aunt offered to do them for me and I will forever be grateful to her for making these for my sweet girl and really bringing her nursery to life! 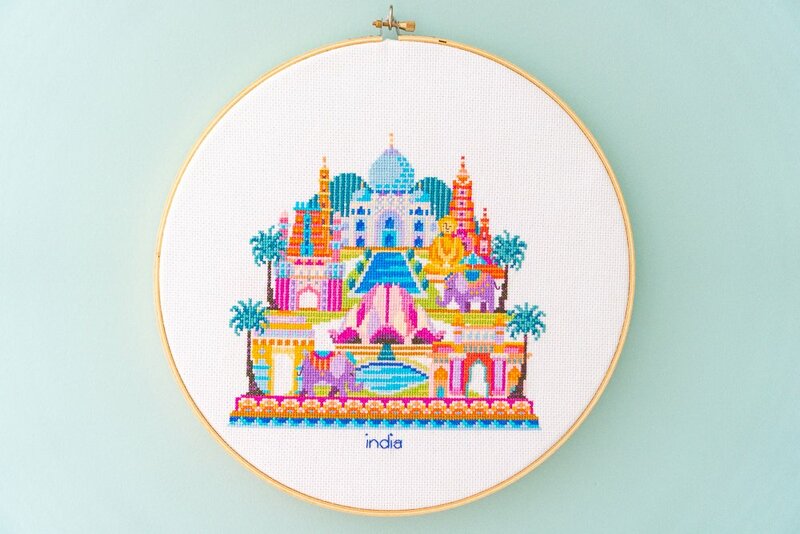 I thought about framing them in square frames but we ultimately decided to do hoop art with them in 14-inch hoops. Here are some close ups of each one! Which one is your favorite? Mine is Hawaii! She also made a birth sampler to match. However, I didn’t photograph it because we’re keeping Evie’s middle name private. 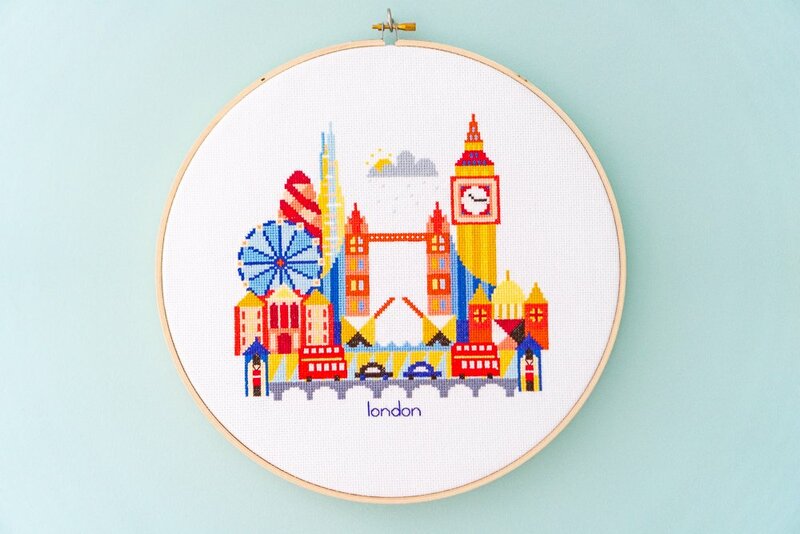 But aren’t these hoop art pieces just gorgeous? I am so in love with them and they make me smile every time I walk in the room! I love hot air balloons and they were a big part of my baby shower. Check out my Free Printable Hot Air Balloon Favors! 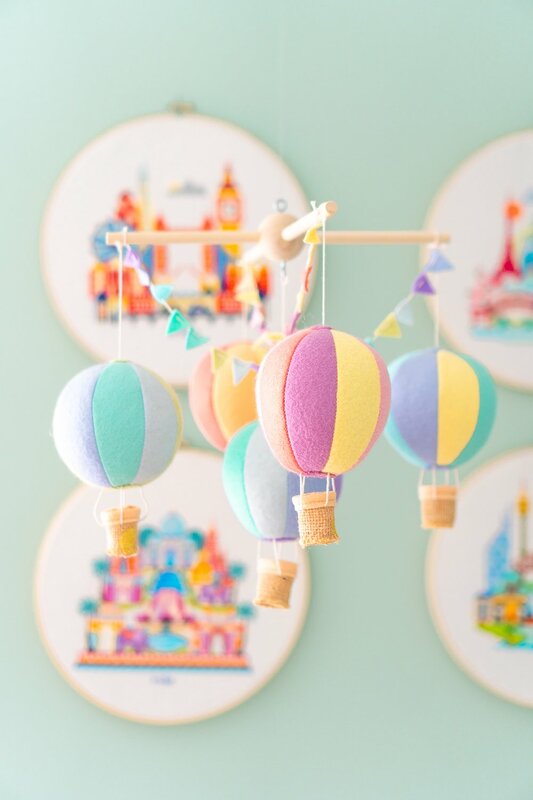 And I absolutely adore the Hot Air Balloon Mobile we picked for the nursery. The rest of the decor was pieced together from my travels as well as stores. 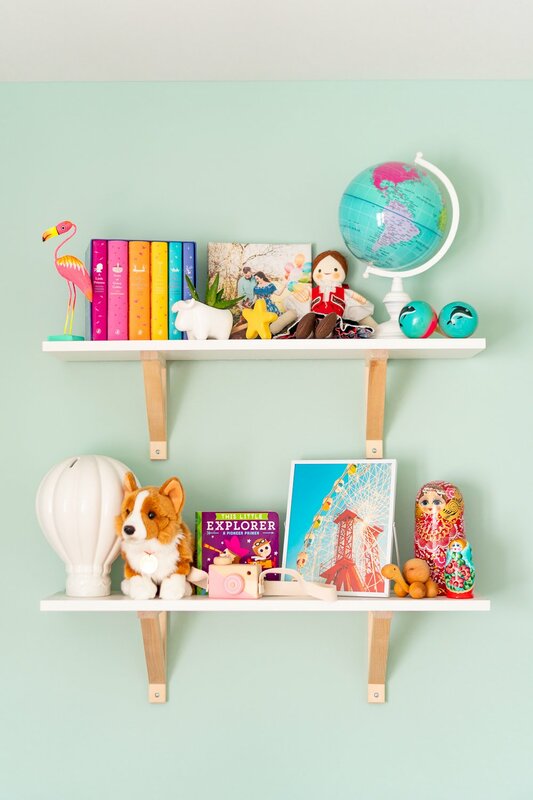 I really wanted some shelving that could be used for decor pieces that wouldn’t really be play pieces for a couple of years. 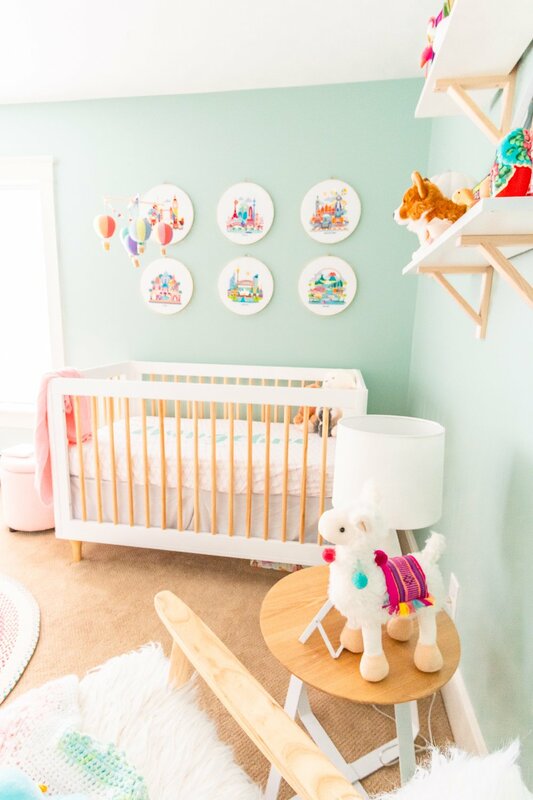 I finally saw these IKEA Ekby Wood Brackets and White Press Board Shelves used by another blogger in her nursery and knew they would match perfectly with the wood and white of our nursery furniture. 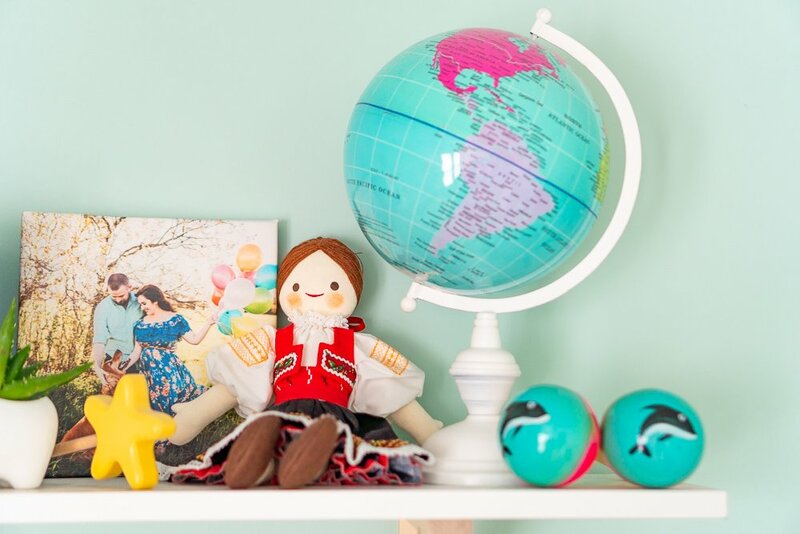 Matt and I always had a feeling that we’d have girls, so I got a little brave with some of my purchases abroad like the doll I got in Bratislava, Slovakia and the carved wooden wand I got in Strasbourg, France. The globe is from Hobby Lobby, the stand was black but my mother spray painted it for me to better match the room. The maracas are something I purchased just a couple of weeks ago in Puerto Rico. The hand-carved flamingo was one of the things I brought back for her from The Dominican Republic a couple of weeks ago. 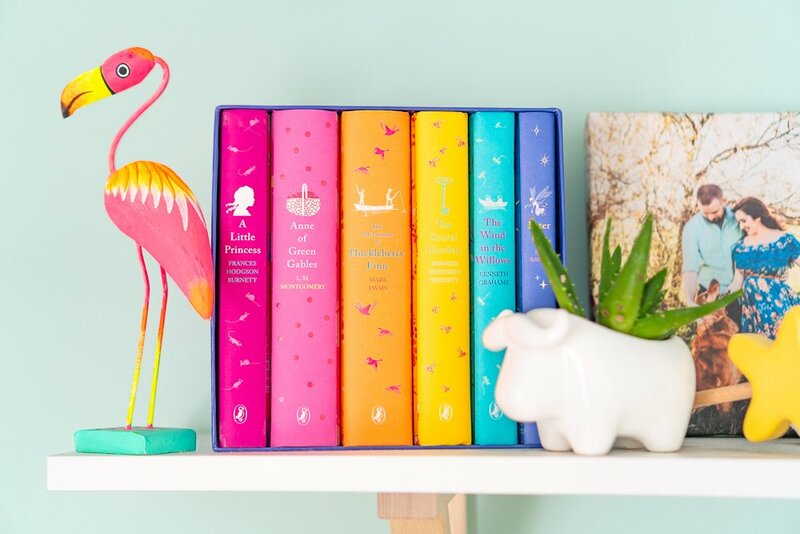 The Puffin Classics Book Collection was purchased on Amazon and the succulent holder is something I found at Marshall’s but you can get a similar one on Amazon. The piggy bank was another TJ Maxx find, but you can find a similar one at Walmart. 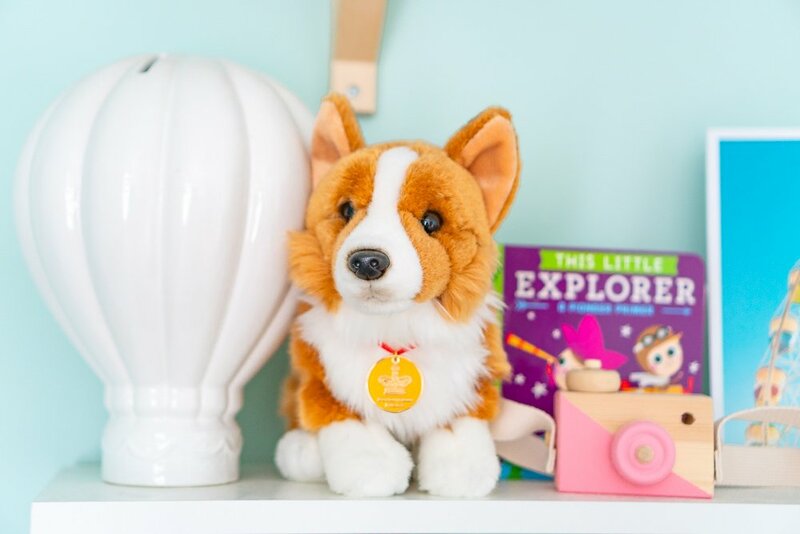 The corgi was something I bought at Windsor Castle during my trip to England in April 2017 (it even has a little crown – not pictured). The wooden camera was a gift from my high school best friend – isn’t it the cutest? You can get them in a number of colors on Amazon! And This Little Explorer is one of my favorite books to read Evie! 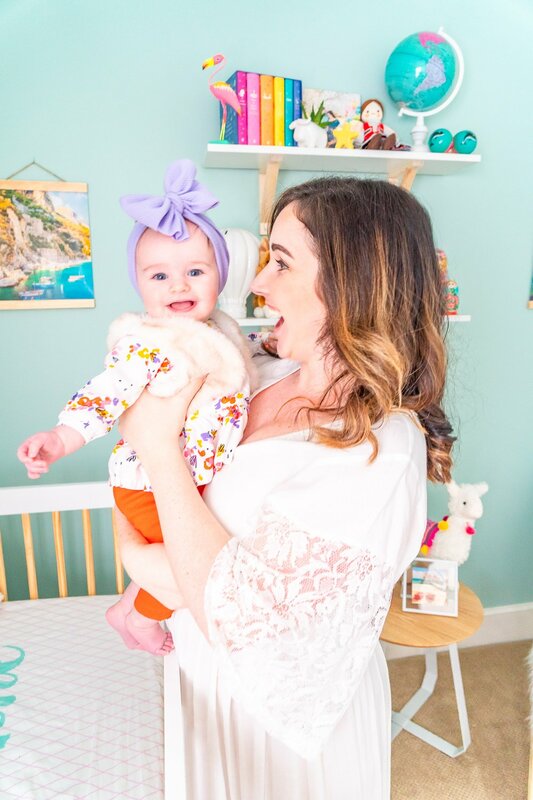 I’ll be doing a full post on my favorite Baby Books soon! The little turtle toy was purchased in Bratislava, Slovakia during my trip there in December 2017. And even though I had purchased several nesting doll sets for friends and family during my travels, I had never thought to get one for myself. I was actually really sad about this when it came time to decorate the nursery. Luckily, I found this Matryoshka Nesting Dolls on Amazon and even luckier, my friend Courtney was traveling through Czechia last summer and sent me another little doll from Prague! I plan to continue to add pieces to Evie’s room from my and our travels together. And I hope one day each piece is a reminder of that fact that no matter where I am, I will always be thinking of her. 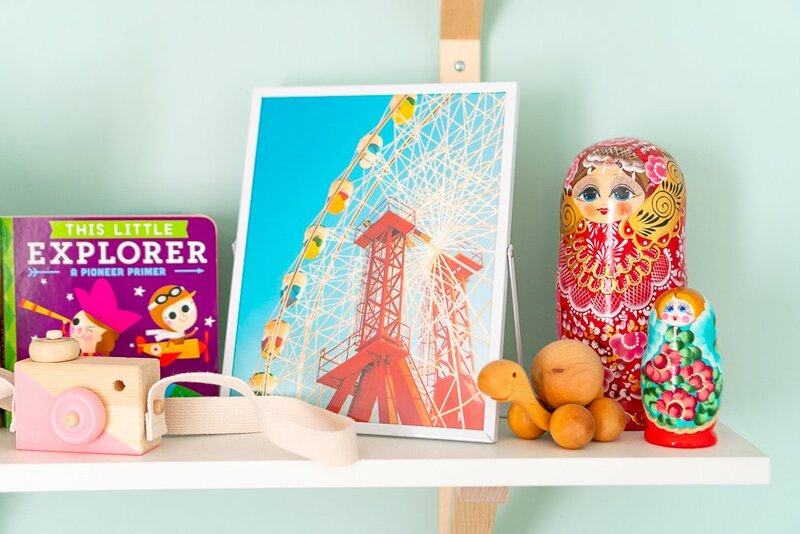 The final pieces of decor are prints of photos I took in Conca dei Marini, Italy and Bondi Beach, Australia hung up with Hanging Wooden Magnetic Frames. 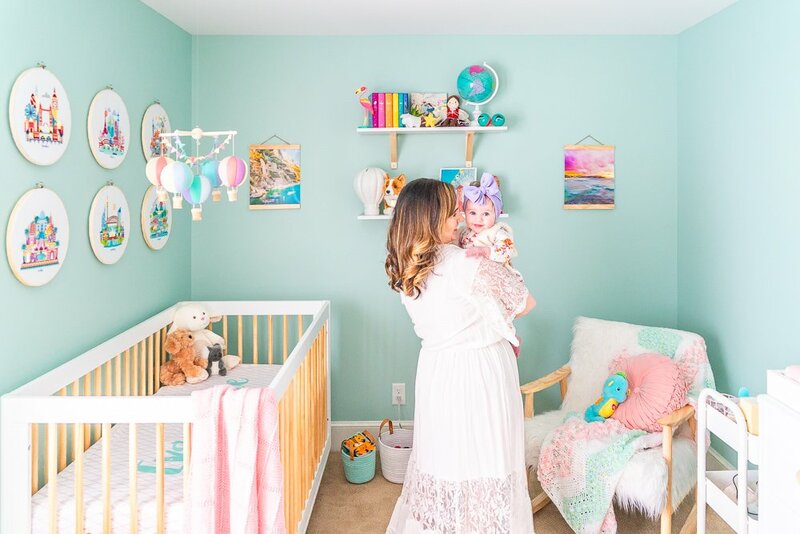 I originally wasn’t going to add any of my photos to her room. However, my mother told me it would be a real shame if I didn’t. 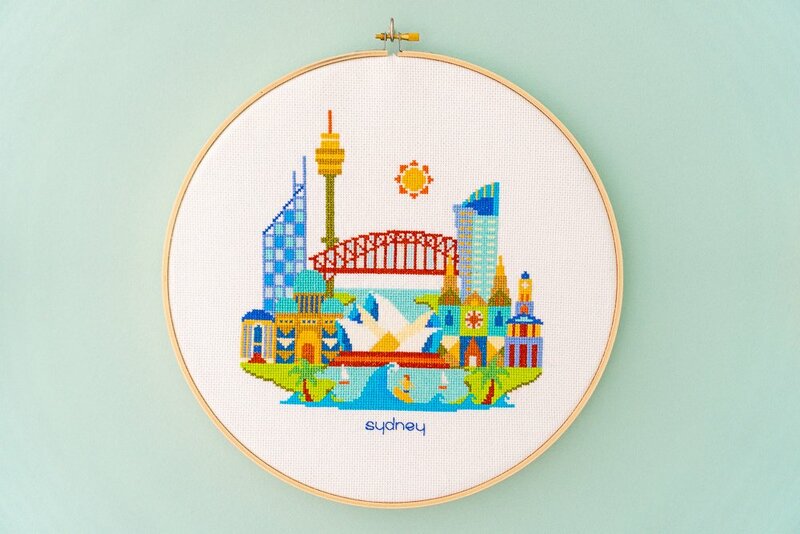 And it really would have been, because I love the personal touch it adds to the Travel Themed Nursery. 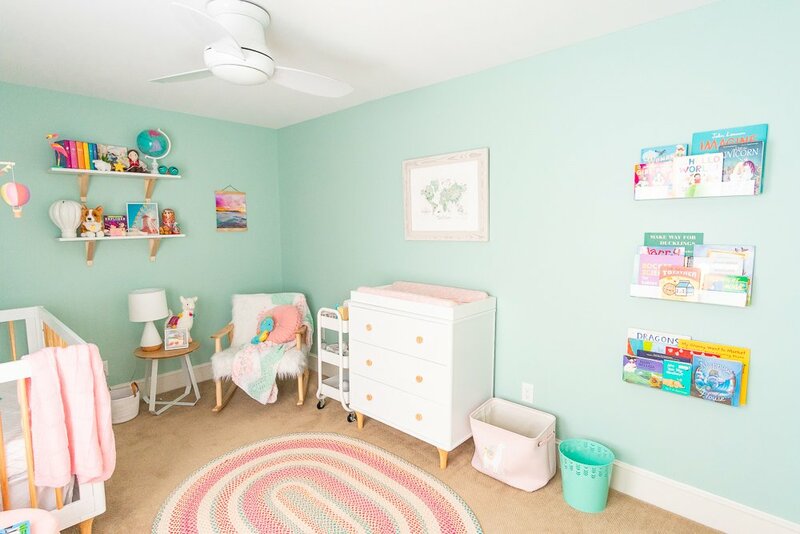 Completing the room for furniture is a pink storage ottoman, rope baskets, and a white Utility Cart. The cart in her room houses diapers, wipes, my breast pump, and other items. We also have one in the bathroom too for her towels, bath toys, and toiletries. Also, my dress is from Amazon, I originally bought it for our Gender Reveal Photos but went with something else. 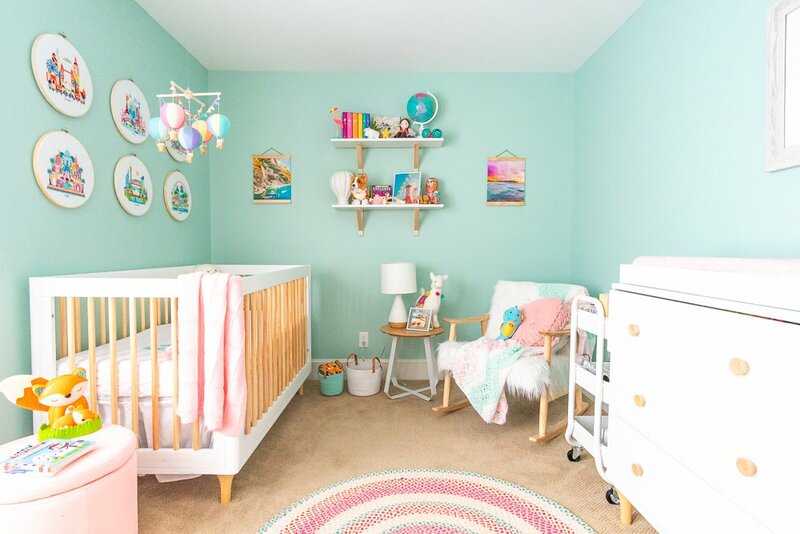 So there you have it, our baby girl’s Travel Themed Nursery. What do you think? I know that she will never appreciate all of the tiny details, but I’m glad I still did them. And I can’t wait to show this little lady all there is to see in this beautiful world we live in. 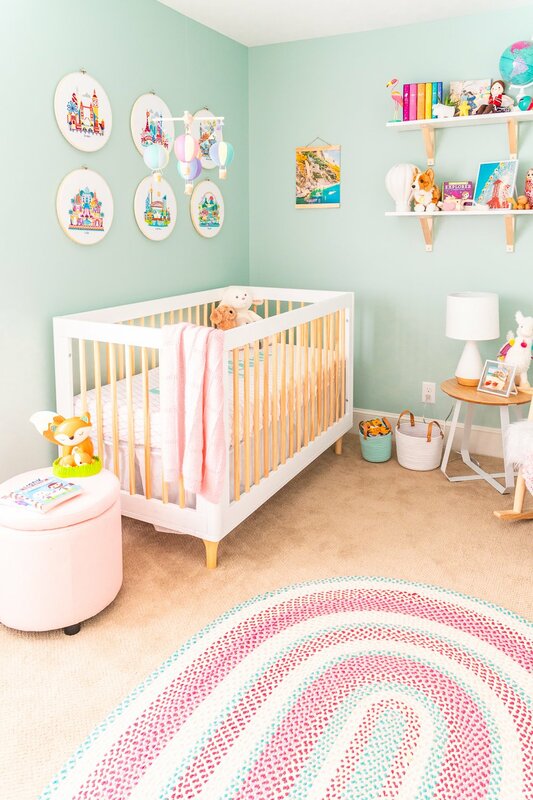 But for now, we’ll explore from the corners of her pretty nursery! Click the button above to save this home decor inspiration to your board! Rebecca her room is beautiful, and bright! I love the idea of incoporating your travels into the design of the room. 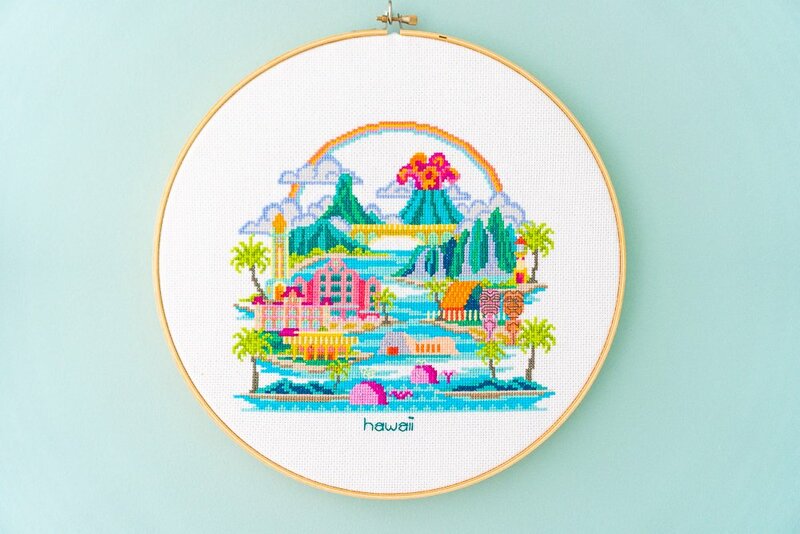 (By the way the Hawaii cross stitch us my favorite as its so bright and colorfull). 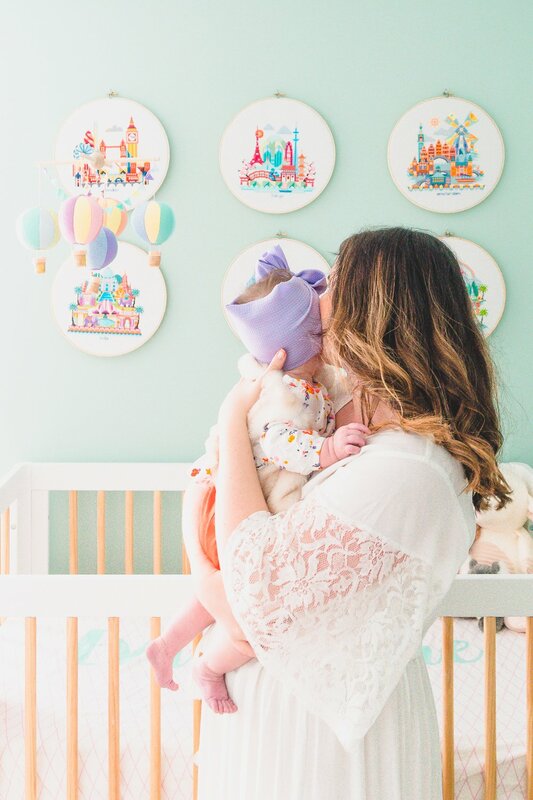 One day you will be able to share where all these things came from and how you picked them for her. She is a lucky little girl to have such a talented mom!! Thank you so much! I’m excited to share them with her!